Hello there! I know, it has been a while. I think it is just the lovely spring weather that makes it tough to do anything indoors. I have been sewing a bit, mostly for swaps and things that I can't show quite yet. Have you seen the New York Beauty Quilt along? I felt like after Curves Camp I had to give this a try. 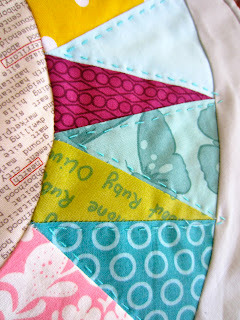 Plus, I love foundation paper piecing and have not used this method in quite a while. This is a mini quilt made entirely of scraps from Block 0, tutorial here. This is the most basic block, and I have to say, this left me wanting to try some more. I was so careful with my corner pieces after my experience last time, and they went together perfectly this time. I was hoping I could get 4 out of my scrap of Kona Ash, but I ended up having to use a piece of pink Kona for the 4th. The one problem I had with this quilt was that I didn't do such a careful job of piecing the center circle, in Hometown News from Sweetwater. I decided to just trim the blocks instead of getting out the seam ripper. While that is totally fine for a Drunkard's Path path block, I forgot how this would affect the points that radiate out from the center. So, things are a bit off, and now I know. Lesson learned. I tried hand quilting and loved that too. It does make for a really soft quilt. The next quilt I finish is going to be hand quilted! Although I didn't plan it, I can link up to Rachel's Scrap Attack! I am still hoping to make a quilt top from these blocks, but I am running out of time! I have to share one photo from my garden. I finally have a few alliums and they are spectacular! I love how it is made up of hundreds of tiny purple flowers. The pink corner is perfect!! Very pretty! Love the hand quilting too! So very lovely and so very summer. Thanks for adding this, Courtney! Very pretty! Love those bright colors.